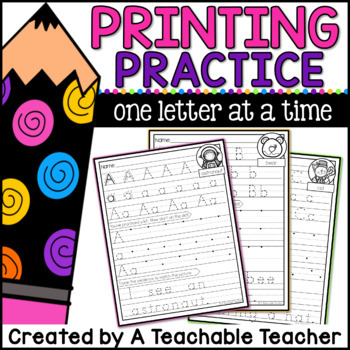 Printing Practice allows your students to practice their best handwriting skills by focusing on one letter at time. 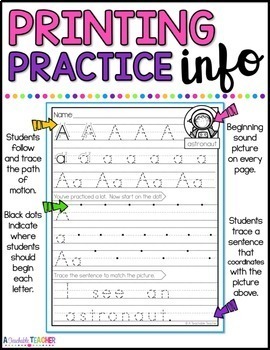 Starting "dots" for each free-handed letter so the student can see where to begin (at the top) and practice the letter multiple times on each line. A traceable sentence using a word that corresponds to the beginning sound picture. There is one page for each letter of the alphabet. 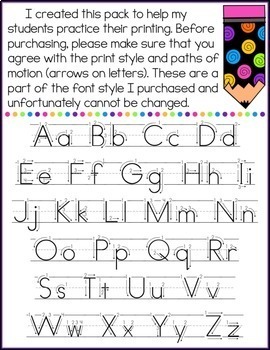 Uppercase and lowercase practice are included on the same page for each letter. There are three optional covers included in case you would like to make a printing workbook with these pages. 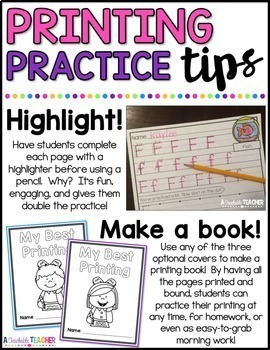 Please see the detailed preview for more information *and* some tips for printing practice in the classroom! As always, feel free to ask any questions using the Q/A tab or by emailing me directly at Lauren(at)aTeachableTeacher(dot)com. Copyright © 2018 A Teachable Teacher, LLC. Permission to copy for single classroom use only. Do not redistribute. Copying any part of this resource and placing it on the Internet is strictly forbidden. This is a violation of the Digital Millennium Copyright Act.